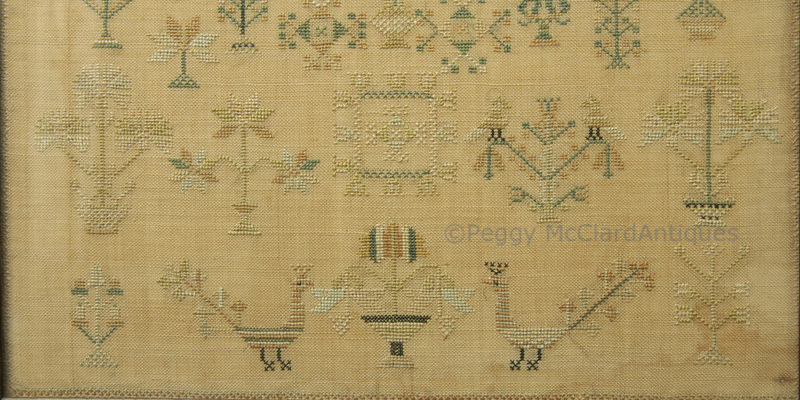 Lovely Pennsylvania German spot sampler done in soft, muted colors by Fianna Hallacher when she was about 12 years old. The sampler is worked in silk thread on loosely woven linen. Colors of thread are greens, camel, gold and white. Fianna signed her sampler at the top “FIANNA HALLACHE / R APRIL 1828”. I always find it charming when these young needlework artists ran out of room for their signature or sentiment and had to run it to the next line. 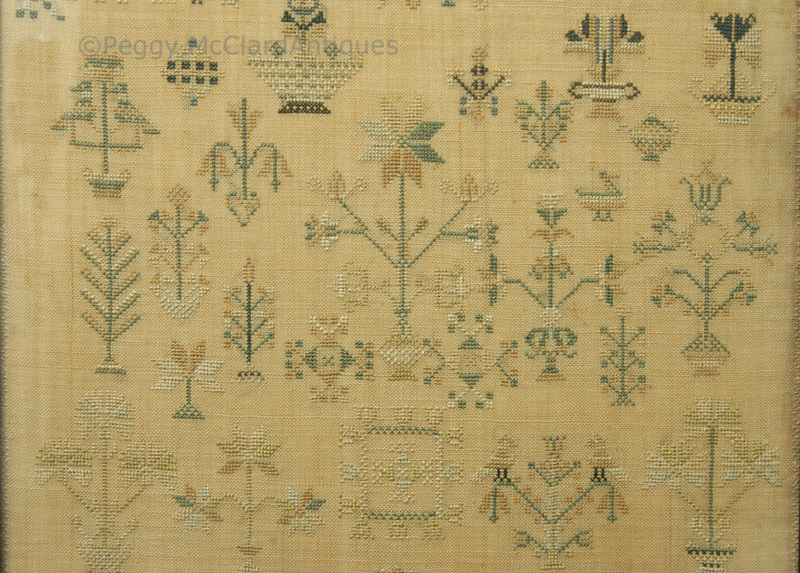 Fianna used motifs such as flower trees, potted flowers, birds in trees and a pair of peafowl on the bottom. Very classic Pennsylvania German components. The sampler is in very good condition although the muted colors are somewhat faded (as expected). There is a light water stain in the lower right corner. 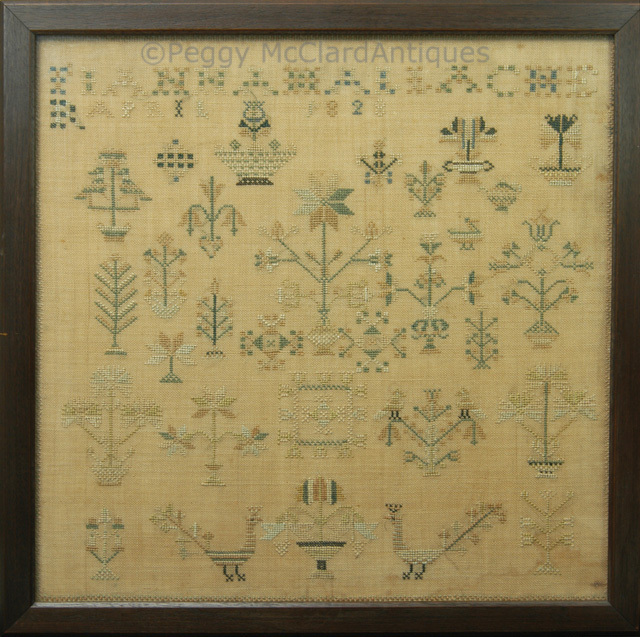 The sampler is conservation mounted in a modern wood frame that measures 18 ¼” square. 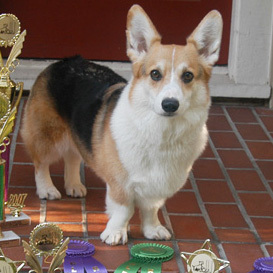 According to my research, Fianna S. Hallacher was born 1816 to Charles Hallacher & Sarah Roth. Her great grandfather was Martin Gross (1760 or 1768-abt 1827 or 1837) who was married to Catherine Schuetz (1741-1782). Fianna married Martin Gross (birthdate alternatively given as 1808 & 1811, death alternatively given as 1847 or 1877). Martin the husband's parents were the same Martin Gross & Catherine Schuetz as Fianna's great grandparents. Fianna's grandmother (Elizabeth Gross 1761-1849 was the sister of Martin's father (also Martin Gross 1768-1837). Does that make them first cousins once removed?? Fianna and Martin were married in Lancaster on January 26, 1836. They had at least 3 children: Samuel, Clara and Annie. 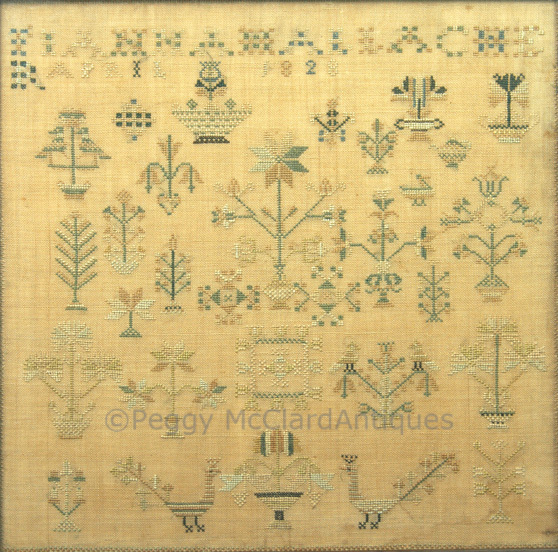 Lovely American 19th century sampler.